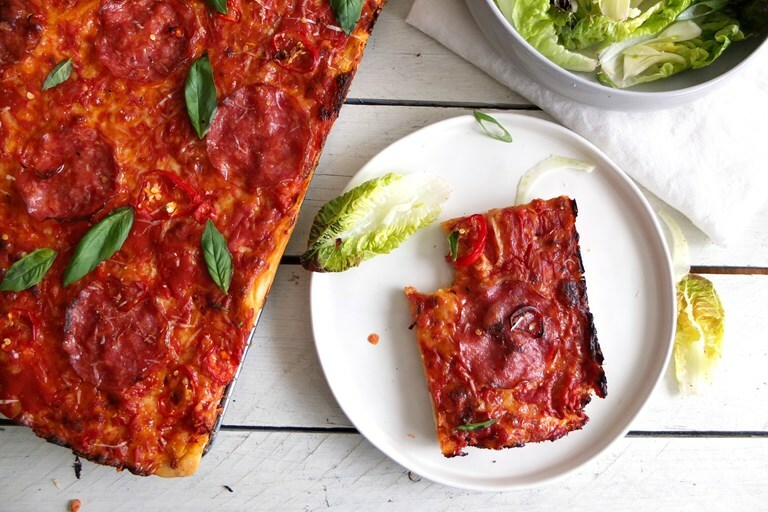 This gorgeous Sicilian-style pizza by Helen Graves is simple to make and full of flavour. A passata-based sauce covers a creamy base of mozzarella, with slices of salami and chilli added on top before baking. You can adapt the toppings as much as you want, but a good tomato sauce is fundamental to this pizza. Sicilian style pizza is made with a focaccia style dough which is light and fluffy. It also differs from other pizza styles in that the cheese is added before the tomato sauce. Any seasonal toppings will work here (try vegetables like asparagus and Tenderstem broccoli) but I particularly love the combination of anchovy with olives and capers, and this version, with salami and chilli.